The most eye-catching explosion of colors of the entire meal, the ahi tuna and foie gras torchon was an attention-grabber of a dish early on in the tasting menu. We were expecting Chef Brendan to balance all the fatty foie with other sweet and tart flavors and he did just that in this dish. A generous chunk of foie on top of the lean slice of ahi with the pork gelée and prune jam was one delicious bite after another. 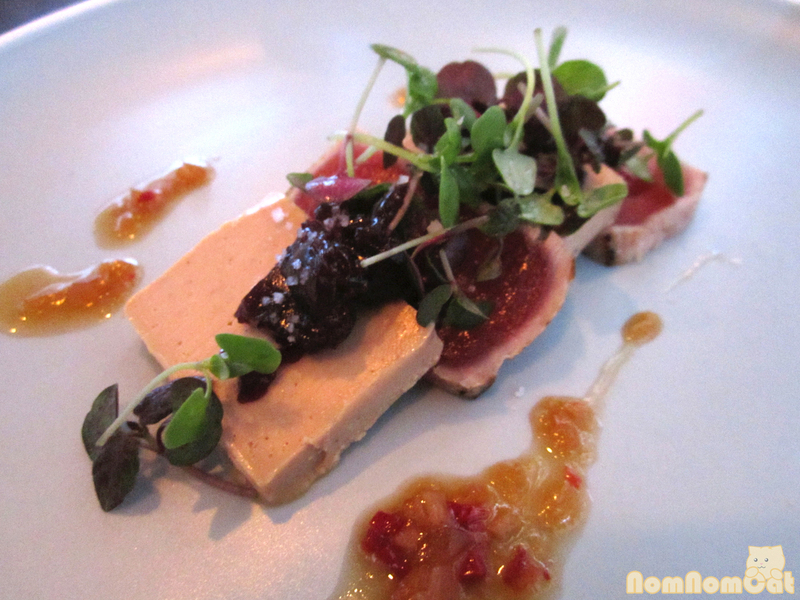 The micro greens provided a much-needed textural contrast between the foie and ahi. Well-rounded dish and tied the chicken liver and foie gras mousse as my favorite dish. 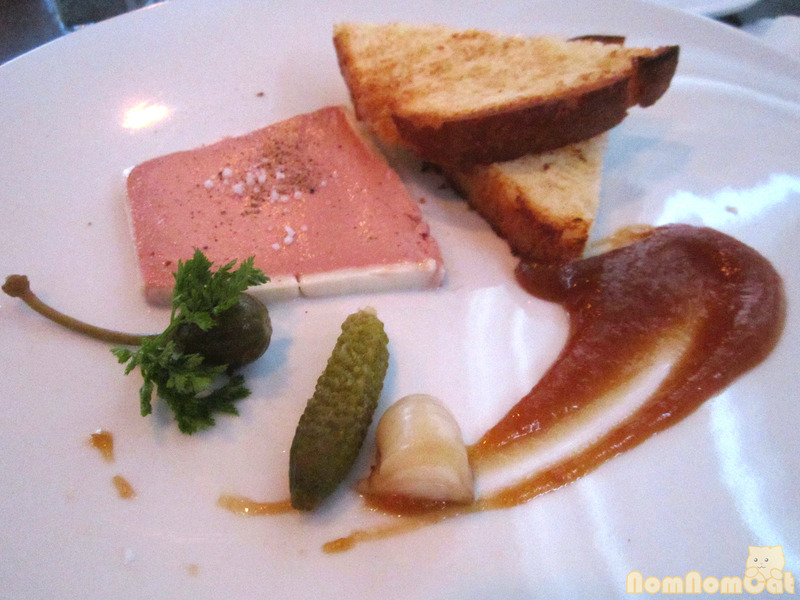 Second course consisted of a foie gras addition to the charcuterie menu’s Chicken Liver Mousse, which gave it a smoother texture. Again, Chef Brendan kept in mind the richness of the foie and included a sweet potato jam to balance the dish. However, it was a little too sugary. Also, the ratio of toast to mousse was a little off to me – I could’ve used another pair of toast (although the mousse was delicious on its own as well). The plate was completed with a caper berry, cornichon, pickled onion. 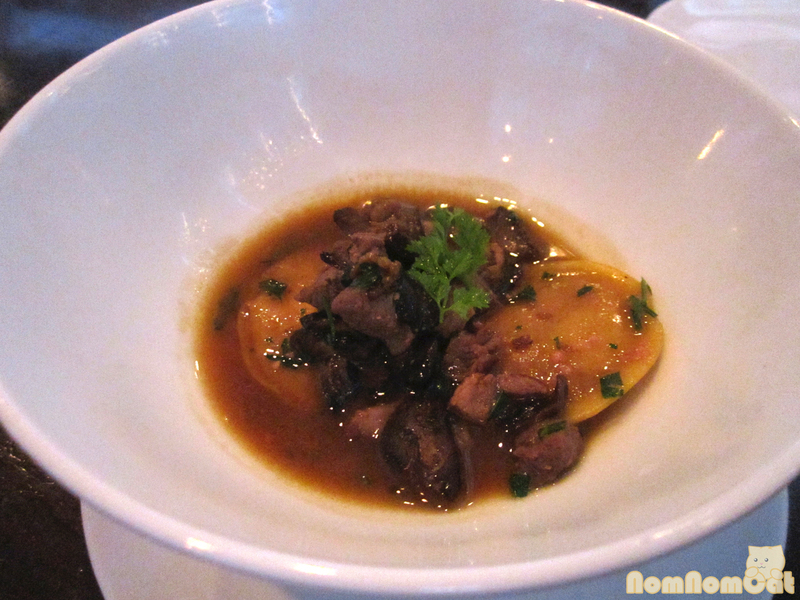 Third course is a foie gras ravioli and wild mushrooms in a duck broth. Alice was a huge fan of the broth which reminded her of a favorite Vietnamese dish she had as a child (mì vịt tiềm). For me, the broth was a little too salty and we both agreed that the pasta was undercooked. We were both a fan of the mushrooms which provided an additional umami flavor. The explosion of foie gras out of the ravioli was especially pleasant to the palate. Unfortunately, one of my raviolis was missing a filling but that was promptly rectified by Cecily, the Maitre D that night. 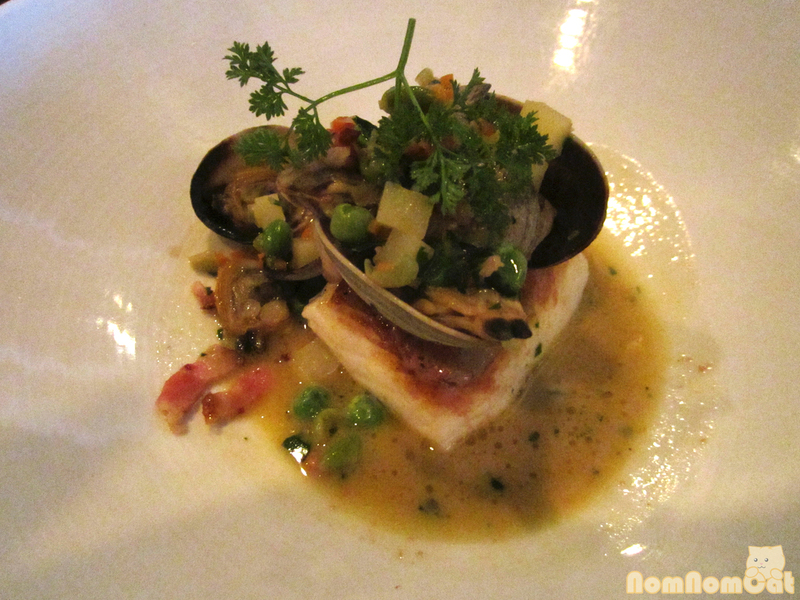 Fourth course consisted of a beautiful piece of halibut, perfectly seared and served with manila clams, potato cubes, peas, and bacon (or pancetta?) in a foie gras sauce. The sauce had great depth of flavor with the rich foie and the smoky bacon. The halibut was beautiful and delicious but as the star of the show we really wanted to see the sear on the halibut so it was confusing as to why the clams were placed on top of the halibut. Nevertheless, the combination of the halibut, bacon, and foie sauce all in one bite was heavenly. It was one of Cassandra’s favorites. The fifth and main course was a generous piece of seared foie on top of a slow roasted duck breast and complemented with micro greens and a plum jam. We’re always a fan of dishes that compose of different parts of an animal and this dish was exactly that. The duck breast had its own jus but also worked surprisingly well with the plum jam. 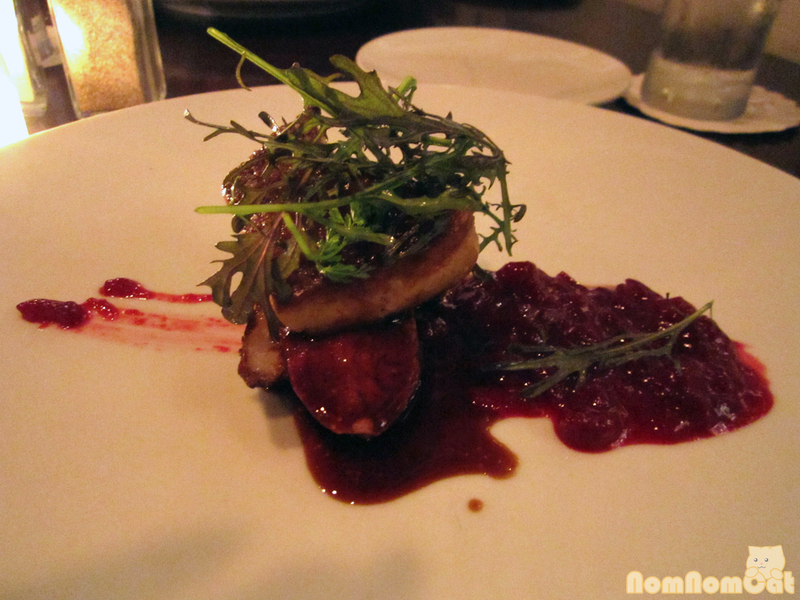 The seared foie definitely needed the plum jam to cut the fat and the ratio of foie to jam was perfect. This dish serves to only reaffirm my belief in the duck. All hail the duck! The sixth and final course is something we haven’t seen on the menu before, although Alice had seen it mentioned as a new menu addition. The “twicks” is kind of like a deconstructed Twix candy bar when eaten all together. Individually, I was a big fan of the chocolate panna cotta and the shortbread. 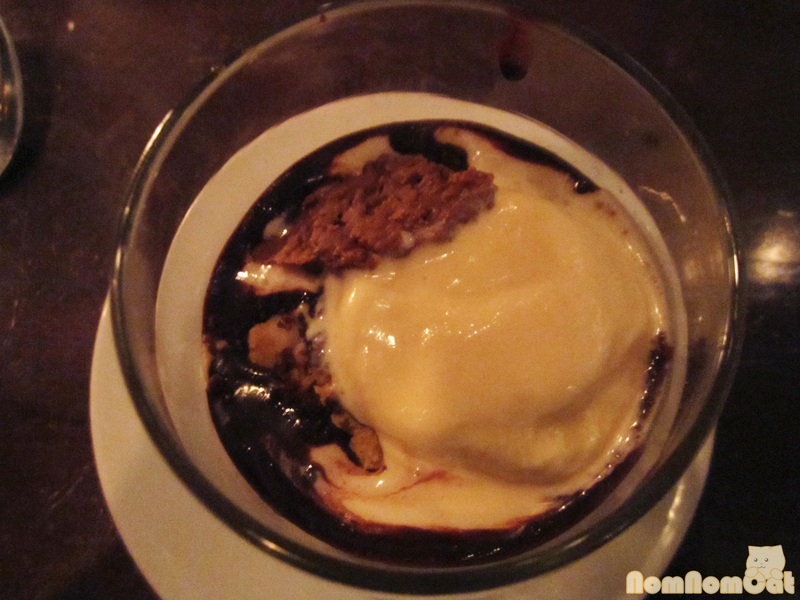 We did not recognize it at the time, but we later found out that it was topped with foie gras ice cream. As delicious as this dessert may be, we almost regret not finishing the meal with the bourbon glazed donuts as we usually do. All in all, we were very pleased with this last farewell hurrah for foie. We popped in to say hi to Chef Brendan at the pass, and he seemed to be having a great time going all-out to work with this delicacy before midnight. Waterloo & City never fails to disappoint, and even though it was Cassandra and Brian’s first visit, they’re already looking forward to coming back and trying dishes off the regular menu. Follow them on Twitter @WaterlooandCity! It was fun sharing this special evening with you and Alice! Thank you for introducing us to this great restaurant. An Au Revoir in a lot of style!